It was so natural, the relationship between his songs and himself. Oni = hero. A boy with this strange schema in his head soon had a great curiosity, and with the aspiration to "become the best" in his heart, encountered music and started singing songs. Kagrra's vocalist Isshi talked to us personally once again and his words are, as you'd expect, very interesting this time as well. This is the last chapter in our 5-month serial project, Kagrra Personal Interviews. Finally, the star performer arrives. In the personal interview last time, Isshi, you were dressed elegantly in a kimono, but this time the theme was a range of human emotions, right? Isshi: I think I'm a multifaceted person inside, but for this I thought I'd try to represent the likeness of a Wisdom King. And what's more than that, it's cool that you seemed to be transformed into an Asura. Isshi: Ah, but that's not an Asura, that's the Wisdom King Kundali. Isshi: Basically, what we call the Wisdom Kings are themselves fierce gods of war. So, in the five Wisdom Kings there are those like Wisdom King Acala and Wisdom King Kundali, but for this I tried to become Wisdom King Isshi, so to speak. I see. Isshi, we know you're quite fixed on the existence of Oni but how long have you been? Isshi: You wouldn't think, but from the time I was really small. The general view is that Oni are scary for children, but Isshi, that wasn't true for you was it? Isshi: Right. In my case, I'd see the children around me fighting battles and shouting "Cool!" and I had the same sense about Oni. But, aren't Oni the standard villain? 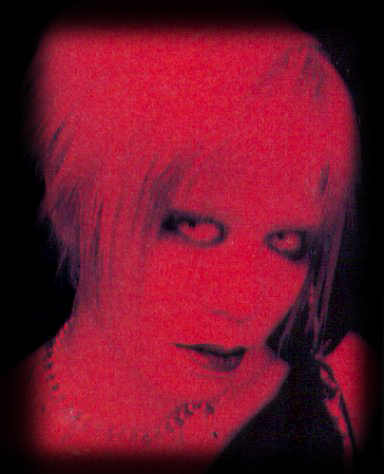 Isshi: Ah, in the beginning I saw them as scary and therefore I started to gain interest. But I can say for sure that except for major fairytales, in which there are Oni who punish humans, the world of Oni is varied. Of course, there are bad Oni too. And the more I know about things like that, it becomes steadily more interesting. ...So how was it that you came to know about Oni in the beginning, Isshi? Isshi: I was told about them from my Grandma, in old stories. There's a lot of folklore about Oni in Nagano. Ah, things like historic ruins? There are Oni lavatories among other things, right? Isshi: And there are things like barrows, you know. A famous one is where there's an Oni called Hachimen-Daiou, and we also have the story of the female Oni called Momiji. For someone with deep interest in such things, Isshi, it would seem that to get there you like to read a lot. When you were a child, did you read books about Oni or did you read other kinds of books? Isshi: I did. I was always going to our book room to study alone, and while I read the manga and children's books that were around me, I also saw colourfully illustrated books with things like Buddha statues, and I'd joyfully say "That's really cool!" You're saying that you're also well-acquainted with Buddhism? Isshi: I'm interested in it. If I'm inclined I may try going to a Zen temple after retiring. Isshi: Isn't zen awesome? What is 'emptiness'? I want to think about things like that. So I have interest in Buddhism. According to people without religion, the 'Oni' that appear in Buddhism are a certain kind of character, that take form as the portion of evil nesting in someone's heart. They feel it's something like that, but Isshi, that's altogether different than the existence of Oni you think about isn't it? Isshi: Not really, I guess it's difficult? When I can understand the things people think about, I start to think endlessly about what's the truth and what's a lie. But I would think that a person who really dislikes humans wouldn't be able to do group activities, let alone be in a band. But, if there's no mutual trust amongst the members then a band can't continue right? Isshi: Ah, people I recognize are okay though. When I came to the city I didn't think about it, but before I came here I was told things like "Be careful, because that's a world where people would pluck out the eyes of a live horse." So, that was the reality I thought I'd see when I came, right? Even though I'd occasionally go shopping in Shibuya, I felt like that. Because it was full of a negative aura. Isshi: They're terrible for me too, so when I go shopping I like to go back home soon. So what you're saying, Isshi, is that even now your foundation of "having grown up in Nagano" isn't changing? Isshi: It's not changing. Therefore, no matter how much time I spend here, I really can't get familiar with the city. So when I go back to my parents' home I think I become more natural. But having said that, where the band is concerned it's better to be here I guess. Your interest in Oni hasn't changed much from when you were a boy, but I heard before that it was around your time as a high school student when you started to gain interest in music. About how old were you when you became interested in singing? Isshi: That was when I was small too, you know. In general, when it came to music the boys my age were interested in rock but didn't sing much. But then I was a perfect singing type. When I was in grade school, I was the only male soprano. Now the falsetto you're using unexpectedly got you some apprenticeship didn't it? Isshi: Hahaha. So it's really natural for me. That's the connection between myself and my songs. So what was your chance to wake up to being in a band? 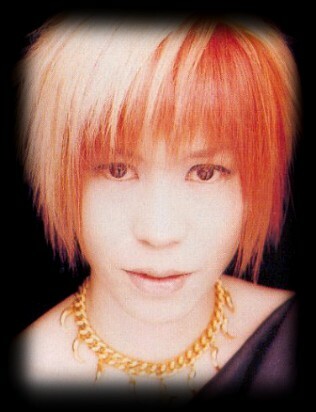 Isshi: Around when I was in middle school. It wasn't that I woke up to it, but more like I happened to see the image. 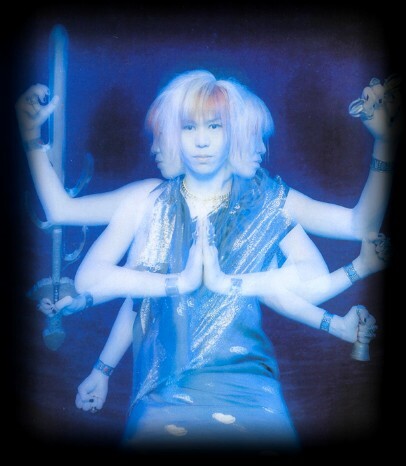 Of a visual kei band. So at that time I thought "Ah, for such a band I'd need to wear heavy makeup, and with four or five people we'll all be flashy." 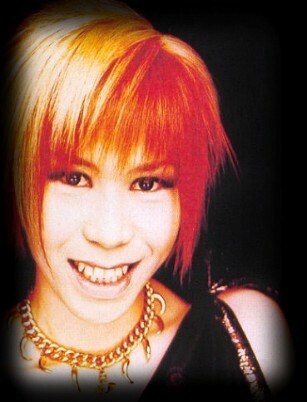 Isshi: Well, from there I was starting to be charmed and aimed to be a guitarist. It's true. So first of all, I thought, I'd have to buy some kind of guitar. I didn't care about what model, but back then I liked flashy things so I thought "That's it!" and bought one. It was hide's model. Was that the mockingbird painted model? Isshi: I thought I'd told them before that, but I guess it's because I was always a baseball boy until then. Anyway, after some time passed, you met the current members. Now you're at this stage, but isn't it peculiar that you're in this position with regards to Kagrra? What I mean is, although Izumi is the leader of the band, with the words as a draft of the band's concept, and the way you seem to put on airs when you talk in this interview, you have a big part in pulling this band along now. Isshi: I wonder if this mightn't be related to my name. What kind of meaning does it have? Isshi: "Isshi" is my real name, but I never really liked my name. Somehow I didn't like to write "aiming for number one," right? That being said, in reality I'd be number two. That was my complex. Isshi: Even my father used to give me a hard time about being number one, and it always seemed like I was behind the guys who were number one. But I hated that. And so when I was a child, I thought I'd do whatever it took to not be number one. Isshi, that meaning seems to have taken form as your unyielding personality, hasn't it? Isshi: I suppose it has. So lately I'm remembering more and more about my great efforts. And I want to be able to face more things than I could in the past. When we talked before, you mentioned going to the gym right? Isshi: Honestly, I'm the type who can do anything reasonably well while aiming to be the best, but so far I haven't had many experiences where I'd had to give an unreasonable effort. I have self-confidence in the things I do, and there's seriously no wish I've made that hasn't come true. You said that before, didn't you? 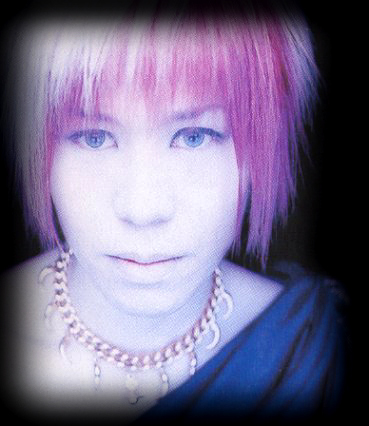 Isshi: I can't say it well, but it seems like a reality. Lately though, because I've wanted to do more things than that, I seem to have started thinking even more about my great efforts. That's a good change, right? Isshi: But on one hand I seem weak to superstitions, I guess because I often watch the fortune tellers on morning TV? And there were 12 of those, so with that alone I didn't want to leave my house for the whole day. I was like that too. (laughs) It seems like I have both extremes. That is to say, you've had your own kinds of jinxes? The environment around you is important, isn't it? Isshi: I'm finely controlled by my biorhythm. That means when I started going to the gym it was also so I could train myself mentally. When I think about it now, it was hard for me back when I played baseball, I'd have the sense that I was forgetting something, and I guess I'd get it back by going to the gym. So as it seems in print, the athletic part of you is mixed with your otaku-like traits, is that right? What about when you sing? Isshi: In that case I'm going back and forth between both sides. It's chaotic, but both sides are myself. But it's not like the pictures from this time, where my range of emotions is violent, so they can't just be taken as they are. On the other hand, when I gain control of them as an expressionist, I have to be able to think about them as they are. About the word 'expressionist', you said before "I want to try writing a story someday," and I suppose your thoughts haven't changed since then? Isshi: It never changes. Of course my songs are part of the foundation, but I've always dreamed of becoming a writer. I want to publish a story version of「gozen」someday. Or rather, what I mean is that I want to write it again, as a separate story. Is that difficult? You want to be a Buddhist, and you want to be a writer too. Ah, so your hands must be full. Isshi: That's right. And now we're recording, but I want to read some books too. After this, the single "Yotogi Banashi" will be released on July 30th, there's a live on August 27th at Liquidroom, and you have plans to release your next album in September, so it seems like you don't have enough hands. The "range of emotions" discussed in this interview comes from the Japanese word "喜怒哀楽 (kidoairaku)" which literally means as the kanji say: joy, anger, grief, and pleasure. They correspond to all of the smaller pictures of Isshi! Also, thanks to sutafairu for the interview text and vkeiri for graphics help.